I made this sound really opaque, but all it consists of is reorganizing the sets of numbers so that it begins with the simplest number (1) and progresses through variations on the theme of one-ness. These variations would be ratios, i.e. fractions, only I’m conceiving of them as more like the feeling of a specific fraction rather than a definitely named number. The feeling of ‘half’ would precede the concept of 1/2, so that the number 2 would be derived from feeling of “one half and the other”. Ok, it’s becoming opaque again, but what I’m going for here is flipping our view of number sets around so that the continuum of numbers is not taken as a space that is filled up with Platonic object generation, but one of a sense-making awareness subtracting and ratios of itself within itself. In this way, multiplication is really a division of (1), and division is a multiplication of those divisions. The above diagram is borrowed from Math is Fun. If we begin from a primordial pansensitivity model, the entire sense of enumeration would be included as an element. That element is shown below as the number 1. I see the ability to hold multiple numbers against each other in conceptual space as rationality. 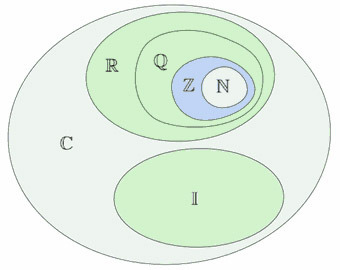 Rational numbering (Q) is more of a verb, situated between the transcendental sense of unity and the enumerated sense of static multiplicity, represented by the Natural numbers (N). This effectively turns the number set relations inside out, so that all numbers are seen to diverge from an intuitive simplicity, and progress into nested complexity and abstraction. Negative numbers extend the natural numbers to Integers (Z) through a numberline concept in which 0 is treated as a kind of mirror. Imaginary numbers, Complex, and Reals take advantage of the original rationality (Q) and its nesting, reflecting, elaborations. 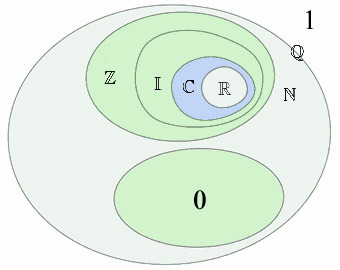 In this diagram, the number 0 is a Natural number apart from all others, indicating its status as the representation of the complete absence of (1) within (1). It appears to mea that what is proposed above is similar to the idea of absolute value, but shifting the central relation from zero (0) to one (1). To call this a one-centric absolute value would mean that 1/64 is equidistant (or at least intrinsically related) to 1 from 64 and that there will be a focus on the infinity between 0 and 1 similar to that between 1 and infinity. At least, that’s what i got from the above post. Thanks. Nice, yes 64 would, in an absolute sense, always be 1/64, so that calling it 64 is just a convenient abbreviation. I hadn’t thought of how it places infinity between 1 and 0, but I like that too. To riff on that I might say that in-finity really has the same meaning as ‘negation of the principle of the finite’, which, if 1 is the totality of enumerating principle, would make infinity the negated 1. To be consistent, the negated 1 cannot literally exist without 1 to define it, so it can only be defined as a virtual negated 1 within 1.